Today is the first day of the Year of the Horse (in China’s time zone) and the students at the Chinese American International School in San Francisco are celebrating by using their talents to create beautiful depictions of horses. Scroll down to view a slideshow of the artwork that leapt out of their imaginations and trotted into the New Year. First, let’s explore the meaning of the horse in this New Year. The Chinese zodiac and the animals it features originated during the Han Dynasty (206-220 CE). The effects that each animal is said to have on a person’s life were determined based on that animal’s behavior and living habits. The horse is the seventh sign in the Chinese zodiac. In Chinese culture, the spirit of the horse represents the desire of people born under that sign to better themselves. The spirit is said to be “energetic, bright, warm-hearted, intelligent and able.” As with any zodiac sign, people born in a Year of the Horse have both strengths and weaknesses. Some of their strengths include cheerfulness, cleverness, kindness, a good work ethic, good communication skills and the ability to work well within a team. On the other hand, they may struggle with impatience, pessimism, wastefulness and a bad temper. The Chinese zodiac has a number of components that determine the outcome of each year. Taisui (Chinese: 太歲; pinyin: tàisuì) refers to the stars directly opposite Jupiter that influence the zodiac as well as Taoism and feng shui, both of which involve living in harmony with nature. According to Chinese belief, these stars represent gods who control the fate of man. The Jade Emperor watches over the earthly realm and is assisted by 60 heavenly deities called Military Generals (many have military attributes) or Cycle Gods. Each deity influences the nature of that year—for good fortune or bad–according to their features and temperaments. For those born under the horse sign, this new year is one to offend, which may result in a lack of stability across all areas of life. Wealth may fluctuate, relationships may be rocky and one could even encounter some difficulties with health. It is said that these people should “keep a low profile” at work, talk to friends and family in order to deal with stress and pay attention to taking care of their bodies and health. People in these cases will often go to Taoist priests for blessings and buy talismans sold in many stores. In feng shui, areas of the house corresponding to that year’s taisui are to be left untouched or misfortune may occur. On the other hand, for those not born under the horse sign, it is said the year will be one of health and prosperity. Good luck will abound and all are encouraged to travel and savor the discovery of a new culture. One thing is certain. A new year brings a fresh start and hope for the future. 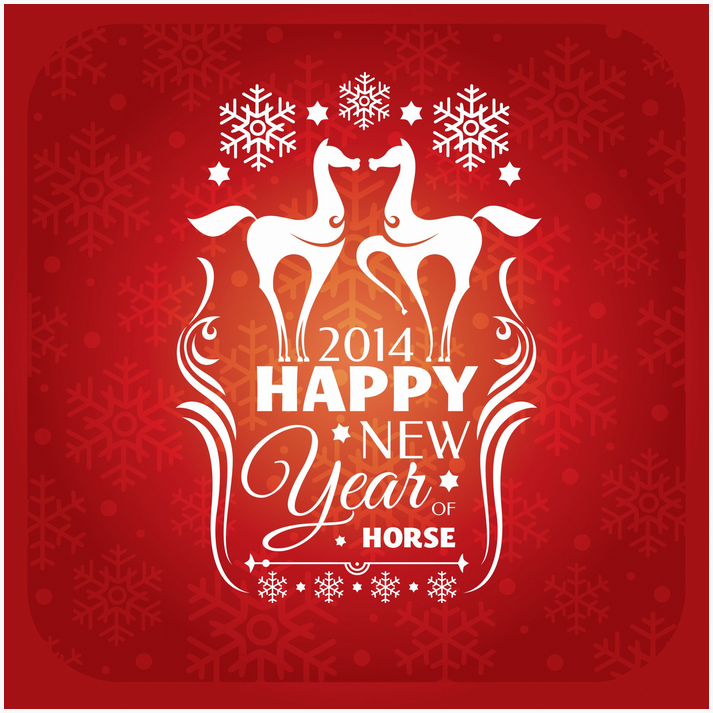 Scroll through the spirited illustrations below as you contemplate what’s ahead for the Year of the Horse. Have your children or students paint or draw their own horse for the New Year. They can hang it up in the classroom or in their house to watch over them during this Year of the Horse! This entry was posted in Art, Blog, Culture, Holidays, Kids: Holidays, Kids: Public Life, Public Life and tagged ancient history, AntiquityNOW, Chinese New Year, Chinese zodiac, Year of the Horse. Bookmark the permalink.